The Injustice Society of the World! 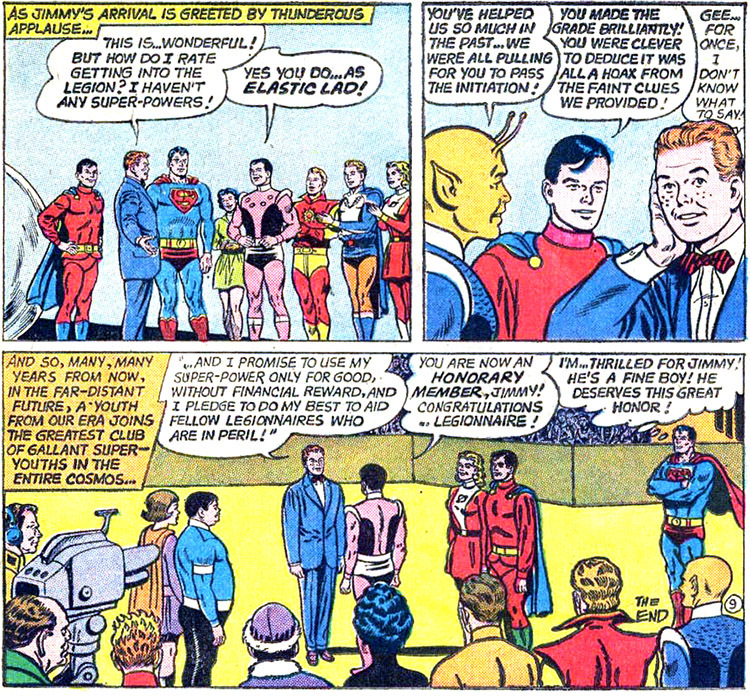 At last a round-up of the super-villains who have menaced the Justice Society! Primarily centered on the Injustice Society, this profile includes lots of other entities. It's due to the consistent presence of one key member, the Wizard. The Wizard was the mastermind behind most of the I.S. 's capers, and he was the leader of the Secret Society of Super-Villains and Crime Champions, to boot. The Harlequin was relentless in her flirtatiousness. 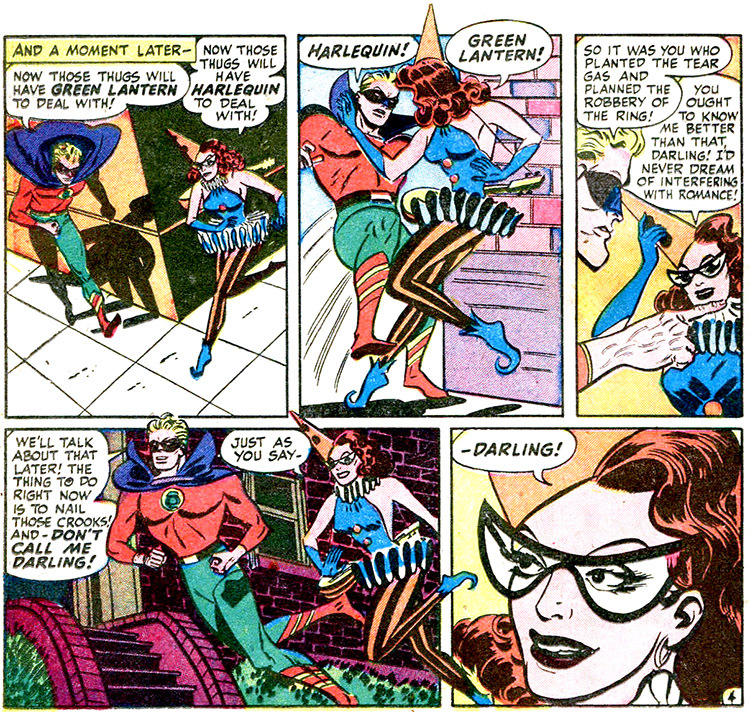 From Green Lantern v.1 #33 (1948); art by Irwin Hasen. Another megaprofile for you on one of DC's founding big guns! Not sure why I chose to tackle this monster, but it is worthwhile and in my mission to complete all JSA related heroes. Alan Scott's history has been long and colorful, punctuated by personal and super-powered struggles. For deducing the act, Jimmy is awarded honorary membership in the Legion. From Superman's Pal, Jimmy Olsen #72 (1963); art by Curt Swan and George Klein. The Allen Family welcomes newborn Jenni. From Legion v.4 Annual #6 (1995); art by Stuart Immonen. The Tornado Twins and XS! Watching the Flash and wondering about the character from the future? The Super-Villains with Echo and Beauty Blaze! From Adventure Comics #355 (1967); art by Curt Swan and George Klein. Original cover illustration by Jack Kirby and Mike Royer for Amazing Heroes #47 (15 May 1984). 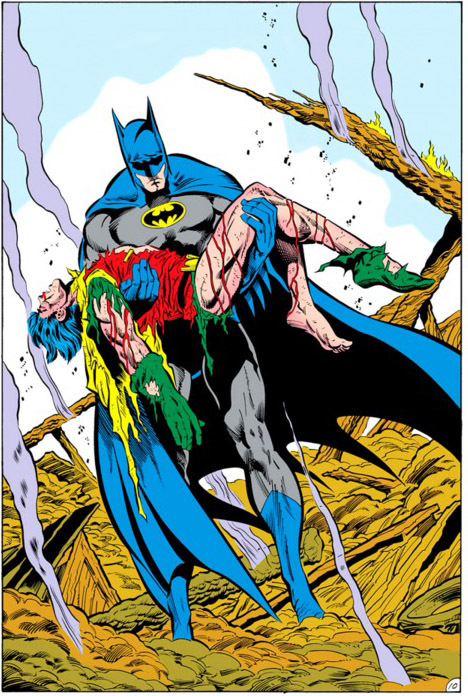 Famous for dying, Jason Todd's pre-Crisis history was different from that which led to his post-Crisis fate. From Batman #426 (1988); art by Jim Aparo and Mike DeCarlo. Given this character's debut on the Titans TV series, I am repromoting the Jason Todd/Robin II profile because it has recently undergone a hefty update thanks to Aaron Severson (see the Golden Age Batman Chronology). The profile covers only up to the Crisis (Todd was rebooted later... did you realize?). The Tigress is changed by her resurrection by Gudra the Valkyrie. From Young All-Stars #26 (1989); art by Ron Harris and Bob Downs. The Huntress! Sportsmaster! The Tigress! This new profile is all in a family... following the popular Huntress (the original) through her marriage to the Sportsmaster and their villainous daughter, Artemis (aka the Tigress). As usual, this took longer than an anticipated and grew greatly in scope after scratching the surface. I had existing profile info from the Obscure Characters section and wanted to integrate it into the JSA section. It was a fun profile to investigate, as these characters have had such an interesting history. Did you realize there were Earth-One Huntress/Sportsmasters, too? "Paula Brooks, it has been said, was the daughter of the original Golden Age Tigress. This Tigress fought the magician called Zatara many times. Nothing else is known about that woman's personal life, or Paula's childhood days. The Dynamic Duo meet their unexpected new butler, Alfred. 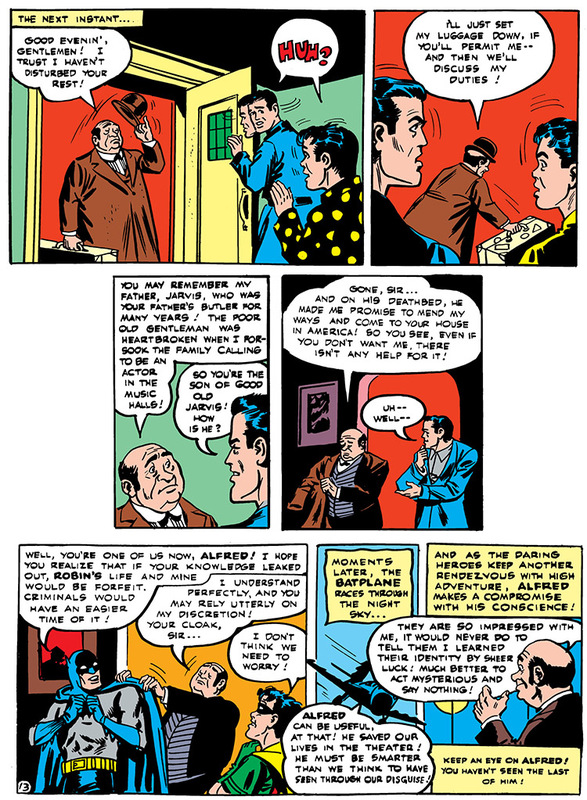 From Batman #16 (1943); art by Bob Kane, Jerry Robinson and George Roussos. 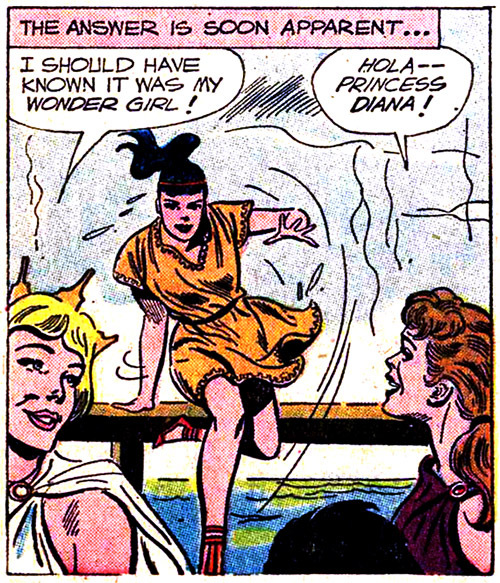 In a new origin story, Diana's heroism began while she was still a girl. From Wonder Woman #105 (1959); art by Ross Andru and Mike Esposito. I did some meaty updates to this profile, so I want to repromote it here. I became intrigued by the whole mess of Wonder Woman continuity in the time period between the Golden and Silver Ages. Wow, there was some crazy zigzagging in this title up until the time that they decided to put Wonder Woman into the all-white mod outfit. The Atomic Knights were soon summoned to help other people in bad straits. 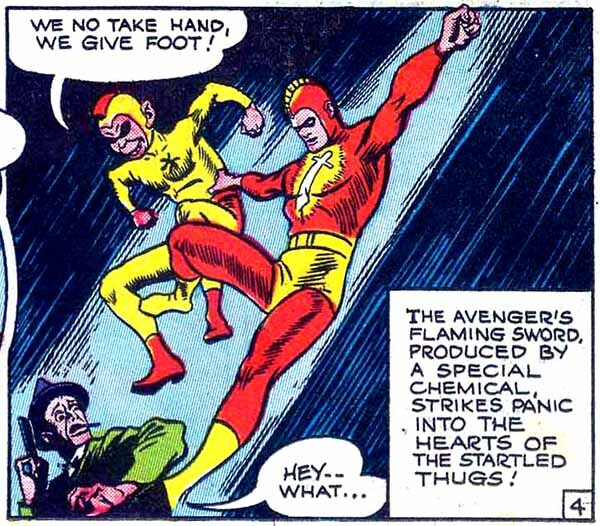 From Strange Adventures #120 (1960); art by Murphy Anderson. Continuing on the Silver Age initiatives, Aaron Severson has prompted another character update. The Atomic Knights have never been more than C-listers, but their original adventures are a Cold War hoot with classic Murphy Anderson art..
Adam Strange + Red Tornado! Selfless and prolific contributor Aaron Severson has helped me clean up and legitimize my profile for Adam Strange, and while I was at it, (and since the two are sort of thematically related) I finished up some recent additions to the Red Tornado profile as well! Following my profile of Dr. Occult, I've decided to create a new page celebrating the legacy of DC's mystical heroes from the Golden Age. Now complete are profiles on the little-known Lando and Nadir, and the peculiar Gay Ghost. What is Doctor Occult? From The Books of Magic #3 (1991); art by Charles Vess. After diving into DC's early days with the Crimson Avenger profile, I wondered what should be next. I still have a lot of DC Golden Age that I want to cover and thought: "Why not start from the top?" My research into Dr. Occult revealed a character with a very significant role in history — as the direct ancestor to Superman. My Seven Soldiers profile led me to do the Crimson Avenger (and eventually the rest), ostensibly because I thought the Avenger would be an "easy one" — because the Avenger's run was shorter than most of his comrades. Have you ever read long stretches of Golden Age comics? It's not great literature. Lucky for you, I've assembled the best bits for you, as always! Solving the time trap of Dr. Doome. 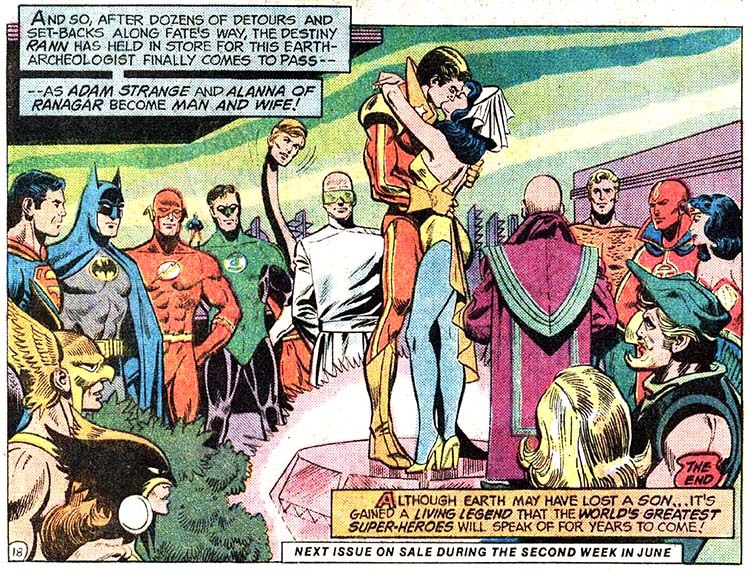 From All-Star Squadron #29 (1984); art by Jerry Ordway and Rick Magyar. Iron Munro tries out a more super-heroic costume. 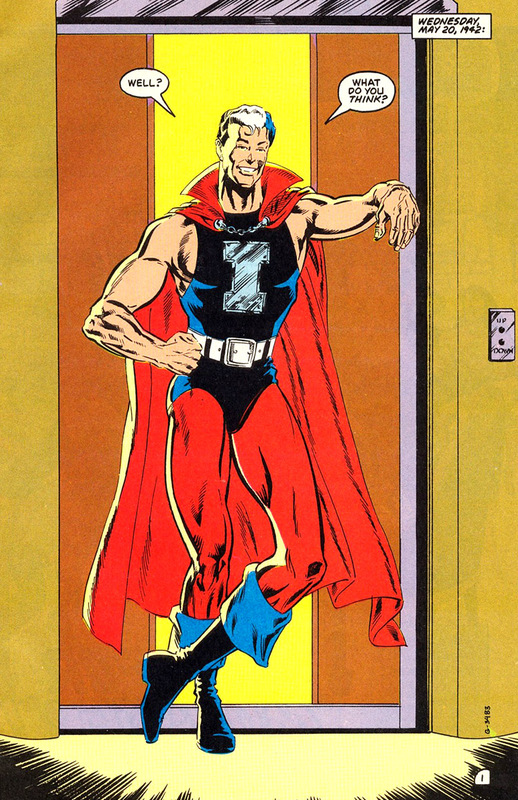 From Young All-Stars #12 (1988); art by Howard Simpson and Malcolm Jones III. I forgot about this one! I acutally completed this profile some time ago but got majorly sidetracked when I started digging in to the Golden Age roots of Superman — which are fascinating, and completely essential to understanding the genesis of Iron Munro. The character embodies Roy Thomas' own exploration into these roots. The All-Star seed was planted in 1976 when he and Tony DeZuniga adapted Philip Wylie's Gladiator (1930) for Marvel Preview #9. Having just read the book, I think that anyone who says Jerry Siegel might have been influenced by Gladiator is just being diplomatic. There's no question that Superman is based on the character in Gladiator (and others, including Doc Savage), and anyone who reads it will understand my assertion. Go ahead: the novel is in the public domain, so you can start reading today! I was prepared to break down the similarities until I discovered that it had already been done, and better, by Will Murray in Alter Ego #37 (June 2004). Murray's "Gladiator of Iron, Man of Steel" dives deep into the matter. 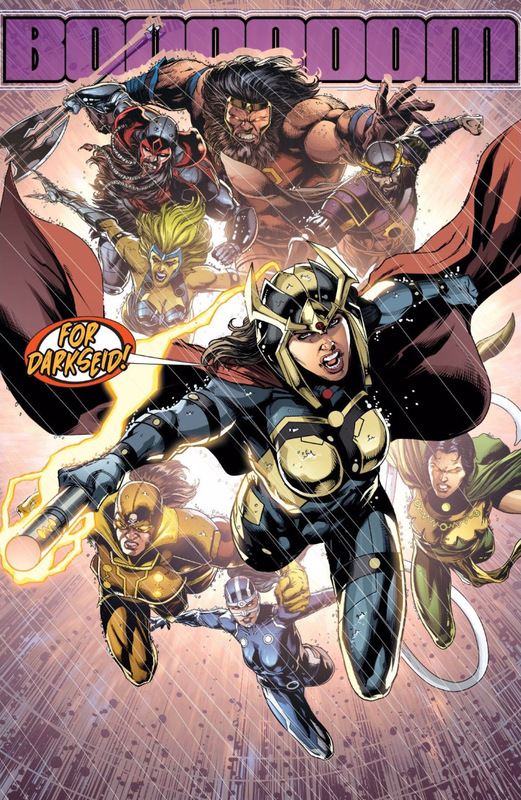 Big Barda leads the forces of Apokolips against Grail. From Justice League #50 (2016); art by Jason Fabok. The New Gods of the New 52! So normally when I write profiles, I take the time to weave together the strings of continuity. But as the New 52 is concerned, I always feel like that would be futile. Maybe not. I could try, but it doesn't seem as possible or interesting as when I wrote about Jack Kirby's original New Gods continuity. It's sad and ironic that the New 52 was launched to give DC a fresh start, but then its editors couldn't be bothered to keep a reign on its universe. In a matter of years it was already a terrible mess. Let's let the new Mister Miracle series roll out and see what transpires, eh? 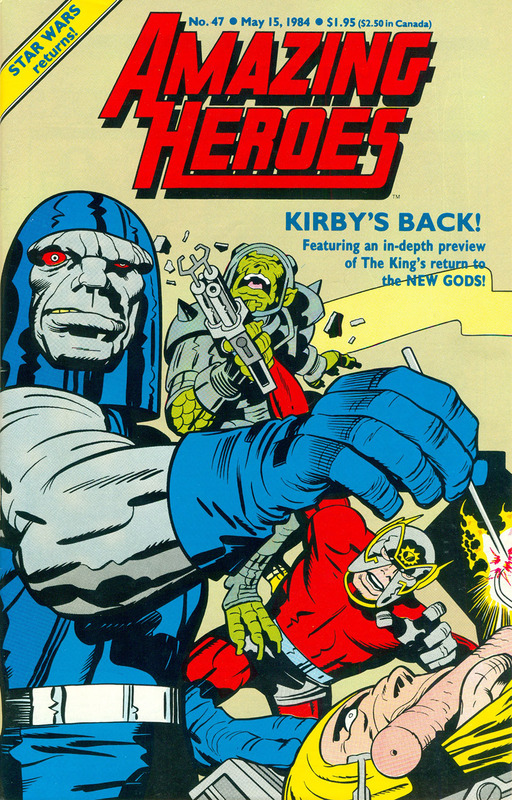 What you'll find in this New Gods write-up is more a chronicle of appearances and story arcs. It is fun to see how they've been reinterpreted and what parts of Kirby's legacy have been saved or modified. As usual, Geoff Johns tried hardest to honor DC history, in the recent "Darkseid War." The Atom family tree! © 2017 Mike Kooiman. Continuing on my mission to complete all JSA member profiles! (And eventually, hopefully, all Golden Age DC characters.) 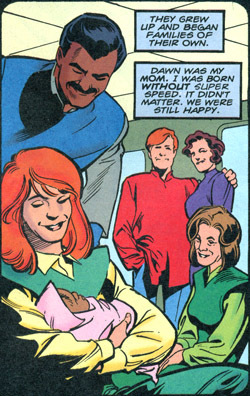 Grant Emerson, aka Damage, is the only biological child of the Golden Age Atom. The character was a 1990s creation that starred in his own series, then became a member of the Titans, and eventually the Justice Society. His story was cut short with his death during Blackest Night, and he has not been reintroduced in New 52 continuity. The Starman/Star-Spangled Kid family tree! © 2017 Mike Kooiman. I started working on the SSK profile a long time ago and quickly realized how many strands came off from this hero! Stargirl, who was original called Star-Spangled Kid II, clearly needed her own profile. And his sister Merry was spun off into her own as well. The Star-Spangled Kid is also tied into the Starman family tree, as you can see above! Legionnaires triptych from the Cosmic Teams trading card set (1993). Art by Chris Sprouse. Yay, it's the all-new, all-young-again Legionnaires! It sure was exciting while it lasted. When it launched, the excitement was largely due to the art of Chris Sprouse. The SW6 Legionnaires were chronal duplicates of the original Legion. They were made by the Time Trapper and unearthed during the Legion v.4 series. 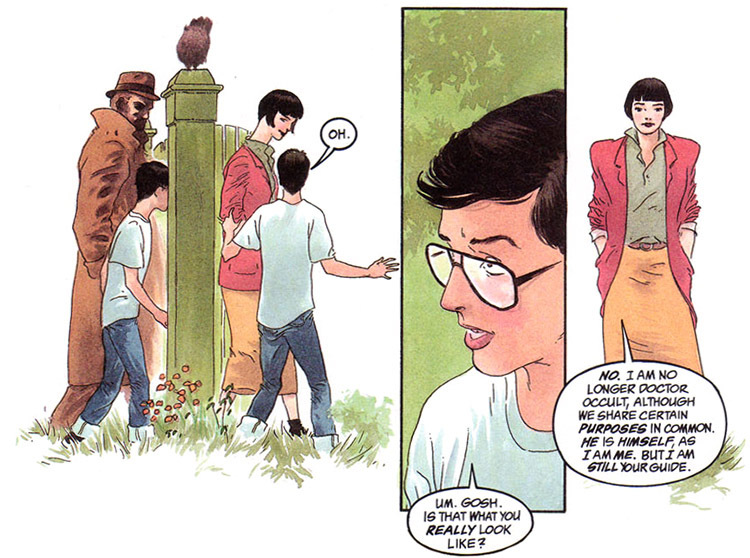 Legionnaires was created to stem the loss of readership caused by the main series' experimental kind of storytelling. Their time was short-lived but the characters became the templates for the post-Zero Hour Legion, which is why today lots of people — creators included — mistake the two for one another. (In fact, Legionnaires continued its numbering even after the reboot). The Justice League United teams with the Legion. From Justice League United #9 (2015); art by Neil Edwards and Jay Leisten. Following the cancellation of Legion of Super-Heroes v.7 (Oct. 2013) and Legion: Lost v.2 (Mar. 2013), the Legion were largely removed from the stage of the mainstream DC Universe. But they have appeared. These appearances have seemed random, and most involve alternate realities. Let's review these appearances one at a time with some thoughts and then chronology listings for the issues! The New 52 Supergirl has a future with the Legion. The Justice League returns to Earth with Ultra, a powerful young alien. Mon-El arrives from the 31st century declaring, "that child must be destroyed... or the Legion of Super-Heroes will die!" Note: This issue uses the Legion convention of entries from the "Encyclopedia Galactica." Part 1: Mon-El attacks the League, coming for Ultra. Brainiac 5, Saturn Girl, and Phantom Girl arrive afterwards and try a more diplomatic approach, proposes 24 hours to try to solve the problem. In the future, Infinitus (the former Infinity Man) emerged in the Polaris system and consumed the planets Thanagar and Psion. Shadow Lass is critically wounded and Mon-El is still in love with her. Brainiac found Infinitus' energy signature recorded in the archives, matching Ultra's. Byth of Thanagar has resurrected Hawkman (Katar Hol) and wants possession of Ultra. Byth unleashes his other agents, the Cadre, in Canada. Note: The Legion in this story arc are from a point in time just prior to the launch of the New 52 (Legion v.7 and Legion: Lost v.2). The "Lost" team has already come to the 21st century, and the Academy students have not yet joined. Part 2: Black Mass steals Ultra away from the League, bringing him to Byth. Brainiac 5 sends his friends, the Legion Lost, to reinforce the League in space. Part 3: Martian Manhunter battles Byth for telepathic control of Ultra. Saturn Girl gives spare flight rings to protect Leaguers in the vacuum of space. Time anomalies begin to occur and other Legionnaires appear (Cosmic Boy, Blok, Polar Boy, Sun Boy, and Star Boy). Part 4: In the 31st century, Dream Girl (leader in Brainy's absence) reviews the Legion's history, showing scenes of battling Universo and the Fatal Five. Infinity Wraiths have reached Earth. At the Time Institute, Legionnaires begin to "swap out" for those from the Earth-247 and SW6 timelines: Andromeda, Magno, Dragonmage, Computo, Kid Quantum, Ferro, Kinetix, Monstress, XS (those who are unique to those timelines). Dr. Krzztell sends them back to 21st century as well. Supergirl crashes into Byth's ship and a rift opens, space collapses and Infinitus emerges. Part 5: Brainy proposes a bomb using Zeta technology to collapse Infinitus. Byth had infiltrated the Ultra project to guide it, hoping Ultra could be a messiah. All rally to detain Byth just as Ultra realizes his potential, and takes the form of Infinitus. J'onn shuts down Ultra's mind just as Brainy launches his bomb. Without Infinitus to absorb the payload, a black hole is opened. Part 6: To stop the black hole from consuming Thanagar, Brainy moves the planet with Zeta bursts, aided by an amplification spell by the White Witch. The planet comes to rest in Rann's orbit but they are no danger to one another. Brainy says, "There is no telling what the changes we made by coming back in time will do to the landscape of the 31st century. All I know is that we did what had to be done." He meets Supergirl (New 52, for the first time) and he wonders if it will change what will happen between the two of them. He plans to return leadership to Dream Girl when they return. Dawnstar says goodbye to Equinox, who is an inspiration to aboriginal women. The Legion takes Ultra back to the future. The Legion that departs is an amalgam of New 52 and SW6. The Legion Lost return as well. Note: If the "Lost" Legionnaires returned to the 31st century at this point, that New 52 series and all Legion v.7 stories would be eliminated from continuity. Dawnstar and Wildfire in the Justice League. From The New 52: Future's End #40 (2015); art by Patrick Zircher. King also wrote Dawnstar and Wildfire into his Future's End tie-ins. This story is set five years in the future and suggests that these Legionnaires stayed in the 21st century and joined the Justice League. The two of them then appeared in a few issues of the main title, The New 52: Future's End (#40-42). 5 years from now: Equinox receives a mental distress call from the Martian Manhunter on Mars. He is the warden of the Gulag: a metahuman prison built there by Terrifitech, the Queen Foundation, and S.H.A.D.E. She finds help at the League's Fortress of Justice in New Mexico. Members Cyborg, Vostok, Flash, Dawnstar, and Stormguard agree to help her. They find Grodd in control of J'onn and Captain Atom leading the breakout. Note: Future's End was set in a possible future, five years hence. The Justice League appears throughout New 52: Future's End, but without Legionnaires. Past JLA member Wildfire answers J'onn's call for help. J'onn seizes a momentary lapse in Captain Atom's concentration and takes over his mind; all are reimprisoned. Dawnstar is reunited with Wildfire. Note: This story appeared in advance of the Legion's appearance in Justice League United. Dawnstar and Wildfire did not appear in any other Future's End stories. The Justice League (with Dawnstar and Wildfire) are the front line defense when Brainiac arrives on Earth; he's come to "collect" a city. The Atom discovers that Brainiac holds memories of many different timelines. The Legion of Death/Doom, an alternate version. From Justice League 3001 #9 (2016); art by Scott Kolins. Early in the 31st century, across the galaxy life has collapsed into a more primitive state following a crisis. For ten years they have been ruled by The Five (including the Convert). Geneticist Ariel Masters worked on Cadmusworld, ceding it to her successors the Wonder Twins, Teri and Terry Magnus (the Five's leader). They use Masters' cloning process to recreate the Justice League—Superman, Wonder Woman, Batman, Flash and Green Lantern. Note: The timeline of Justice League 3000/30001 is an extension of the post-Crisis Justice League and nothing definitive was ever stated in regards to this Earth's designation in the multiverse. Five member Locus sends the League to prison planet Takron-Galtos. First appearance of Five member Coeval. The League discover that Takron-Galtos was once called Earth. Note: This revelation fairly well removes any possibility that the timeline of Justice League 3000 has any relation to the Legion's. Five member Kali attacks and recruits the League's newest clone, Firestorm. Terry kills his sister, Teri. Ariel Masters resurrects Teri Magnus as the Flash. The Justice League settles its headquarters on Camelot Nine. The JLA coax the Five there and take out the Convert, Kali, and Locus. Coeval retreats and Terry Magnus is apprehended by Ariel. Lancelot helps the League hold the members of the Five in stasis. Terry creates a new Injustice Society: clones of Bane, Lois Lane, Mirror Master, Sinestro, and Zeus. Beneath Galtos, workers excavate a chamber holding Booster Gold and Blue Beetle, from the 21st century. The Flash finds the palace of Ice, who is immortal. On Wodin 12, Leaguers investigate the killing of a group of young metahumans who attempted to interfere with the Starro Consciousness, in violation of a treaty. Note: The youths are clearly analogues for the Legionnaires Sun Boy, Duo Damsel, Element Lad, Wildfire, Dawnstar, Chameleon Boy, Ultra Boy, and Projectra. Lady Styx takes over the Commonwealth. On her base world of Naltor, Captain Imra Ardeen comes to brief her. Note: In pre-New 52 continuity, Lady Styx was a space conqueror that appeared in 52 #31 (Dec. 2006). Two courtiers strongly resemble Legionnaires Wildfire and Timber Wolf. Styx's boots resemble those worn by the White Witch in her first appearance, Adventure Comics #350 (Nov. 1966). Styx transforms Terry Magnus into the new host for Eclipso. He leads royal guard, the Legion of Death. Scion, a Shazam inheritor, serves Styx as bodyguard. Note: This Legion is clearly analogous to the Legion of Super-Heroes. Only two members are ever named, Imra Ardeen (Saturn Girl), and Salu (Shrinking Violet). Obvious counterparts include those for Wildfire, Lightning Lad, Cosmic Boy, Timber Wolf, Colossal Boy, Phantom Girl, Brainiac 5, Chameleon Boy, Blok/Sun Boy, Mon-El, and a hooded member. Salu of the Legion spies on the Justice League on Paradise Island. Eclipso leads the "Legion of Doom" against the League. The Flash realizes Eclipso is her brother and for a moment he comes to his senses, wanting freedom. Styx reveals she is the Magnus twins' mother. She also has power over time; she sends Teri and Batgirl to the 21st century. Legionnaires discuss the reality of their situation on Telos. From Convergence: Superboy and the Legion of Super-Heroes #1 (2015); art by Gus Storms and Mark Farmer. "Convergence" was meant to celebrate the continued existence of characters and timelines from across DC's histories. Instead, it's inconsistent execution led only to confusion as to its purpose. Heroes were pitted against one another by Telos, minion of Brainiac, who had been collecting cities from dying timelines. The victors would go on with the hope of having their city reinstalled in "real" space. The SW6 Legionnaires appeared as adversaries in Convergence: Blue Beetle. The members of this group included SW6 and some from the post-Zero Hour Legion. More than likely, writer Scott Lobdell didn't take the time to learn the difference. 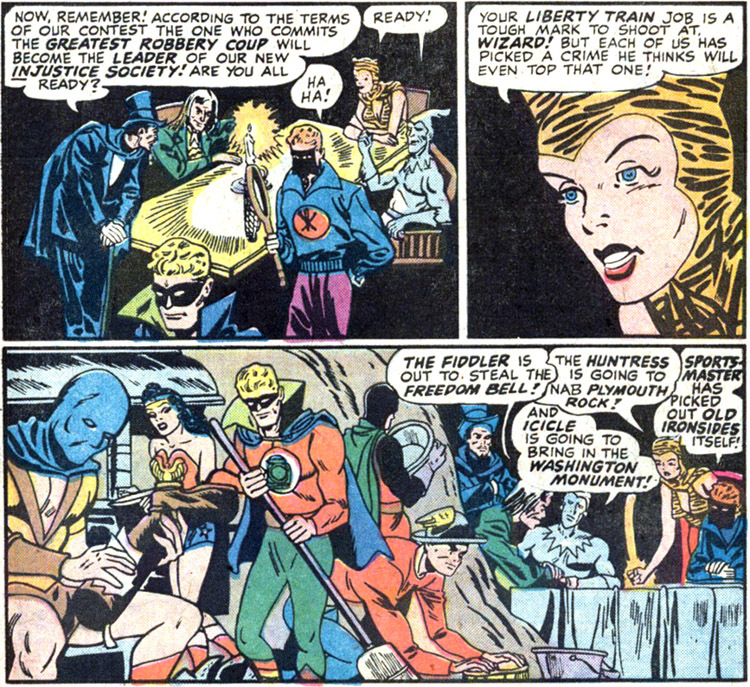 In Hub City from the former Earth-4 (home of Charlton comics heroes), the Blue Beetle, Captain Atom, and the Question confer about what to do with Telos' ultimatum to fight to the death. Cosmic Boy of the SW6 Legion approaches them diplomatically. This grouping of Legionnaires contains SW6 and Earth-247 Legionnaires together, without any explanation. They come from the salvaged cities of Earth, which were taken into space after Earth's destruction. In the end they allied with one another and the Blue Beetle created an illusion to make Telos believe the Legionnaires had triumphed. On the patchwork world of Telos, without their powers, the Legionnaires use their flight rings to help the people of Metropolis. They include Superboy, Colossal Boy (trapped at 12 feet tall), Sun Boy, Ultra Boy, Lightning Lass, Shadow Lass, and Invisible Kid (Wildfire was dissipated). Lightning Lass asks Superboy if she should call him Superman at this point. Brainiac 5 and Computo have ascertained that they are not on Earth. Timber Wolf left prior to this for a "walkabout," was still with Ayla. As she talks with Superboy they nearly share a kiss when lightning jumps from her lips and they realize the dome has come down. Before they can form a plan, the Atomic Knights appear in their city, ready for battle. Element Lad is Legion leader, but not there. Notes: This occurs sometime after the LSV saga. The Atomic Knights first appeared in Strange Adventures #117 (June 1960). The Atomic Knights propose the Legion surrender, to save violence. That fails and they fire on Sun Boy. Wildfire returns, saving a Knight from killing Invisible Kid from but they threaten releasing their Morticoccus virus. Superboy negotiates a truce and Brainiac 5 proposes combining their technologies to track down their jailer. Superboy kisses Lightning Lass before the Legionnaires depart for the Knights' Durvale with supplies. Heroes released from their cities on Telos are sent on a mission to prevent the original collapse of the Multiverse (in Crisis on Infinite Earths). They succeed and result restores and stabilizes their homes as the New 52 Multiverse. Though their homes are restored, they are "updated" (per the Multiversity Guidebook). Brainiac claims, "Each world has evolved, but they all still exist." 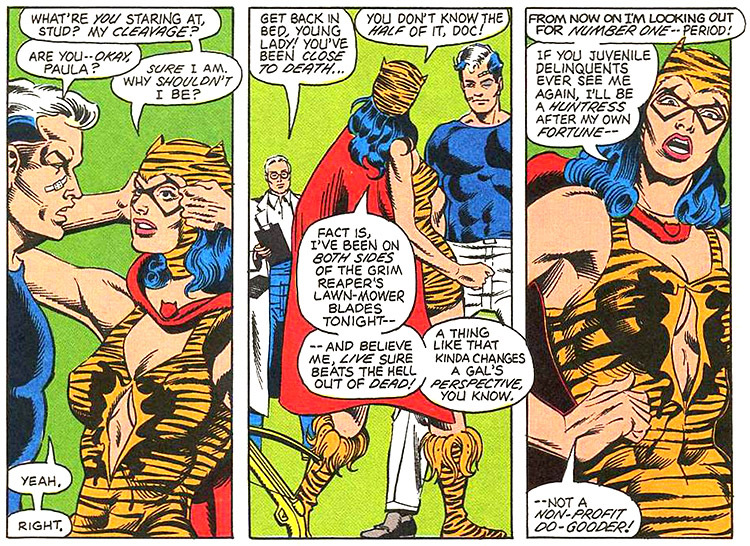 Batman takes no notice of Jane Doe, aka Saturn Girl. From Batman #9 (2016); art by Mikel Janin. And recently there have been some clues about the Legion's formal "rebirth," beginning with Saturn Girl's appearance in DC Universe: Rebirth and more recently in Batman #9. There is a large event in the making, allegedly penned by Geoff Johns. Other titles have also begun to set the stage. In Justice League vs. Suicide Squad, we discovered that the Emerald Empress has also been in the 21st century for a while, looking for Saturn Girl. On their website, DC Comics says, "The "Empress" [is] one of the most feared villains of the 31st Century, occasional leader of the Fatal Five and mortal enemy of the Legion of Super-Heroes. Not much is known about the Eye itself, other than the power it grants those who bond with it. However, signs seem to indicate that it's some sort of parasite; that it may actually be the puppeteer rather than the puppet. Sarya's first defeat was actually a surrender. She had to beg Sensor Girl of the Legion to separate her from the Eye, which would not allow her to die." Sure sounds like status quo for the Legion, to me. There are murmurs that the story will continue in Supergirl. Saturn Girl is a patient at Arkham Asylum. She says, "I've seen the future." They have her Legion flight ring. She wants to speak with Superman and is questioned by Metropolis police. Notes: Writer of this issue, Geoff Johns, said, " Saturn Girl is the heart and soul of the Legion of Super-Heroes. When everybody's saying, 'Legion doesn't work anymore. There's too much xenophobia. You can't change people.' Saturn Girl says, 'Yes, you can. Then suddenly, you realize she can read people's minds. She knows everyone's deepest darkest secrets. If she has faith, then at the base level, human beings and aliens and everybody can reach that goal, can reach achievement and have that goodness inside them. I believe her. I'm with her. And that's why Saturn Girl is so important to the Legion. She's at the epicenter of truth for the entire universe for me." While collecting operatives for his own Suicide Squad from Arkham Asylum, Batman passes a Saturn Girl (named "Doe"), who draws a Legion symbol on her cell wall. Notes: Writer Tom King said, "There is this huge spine running up the back of the DC Universe, and 'Batman' ties directly into it and it is plotted out to 2019 and even beyond that. Saturn Girl ... plays a role in the story going forward." Several years ago: Amanda Waller forms her first Suicide Squad with Rustam as Task Force X field commander. He leads Dr. Polaris, Johnny Sorrow, Lobo, Cyclotron, and the Emerald Empress, who seeks intel about Saturn Girl. Lobo kills Cyclotron destroying the whole island, knocking the Squad out, and they're reimprisoned. Maxwell Lord frees the original Suicide Squad from Belle Reve penitentiary, for revenge against Amanda Waller. The Emerald Empress comments, she "feels like time is missing. I must find the Legionnaire." The Empress' Emerald Eye of Ekron is described as a weapon of immense mystic energy, and has elements of Green Lantern technology. The Empress advises Superman to let Max get what he wants, if he wants a better future. The Eye refuses to fire on Green Lantern Jessica Cruz. G.L. Simon Baz damages the eye, forcing the Empress to retreat, continuing her search for Saturn Girl. Note: An editorial note says this plot thread will continue in the pages of Supergirl. Many of DC's heroes ended their runs because of reduction in page counts, or canceled or reformatted titles. Writer Gardner Fox was the creator of both the Justice Society and the Justice League. It stands to reason that the characters he was most familiar with would be furthest to the front of his mind when it came time for reinvention. Likewise, Justice League editor Julius Schwartz, and writer John Broome had been active during the production of Golden Age titles, and engineered other key Silver Age revivals. Original characters with unbroken publication records (Superman, Batman, and Wonder Woman) or with a mostly-continuous presence in comics (Aquaman and Green Arrow) were the foundations of the early JLA (and the Super Friends). The team's founding roster was rounded out with reinventions of Golden Age anchors, the other two who'd held their own titles, the Flash and Green Lantern. The remainder of the Justice Society members who were still active when All-Star Comics ceased publication (Hawkman, the Atom, and Black Canary) were also among the first to be reintroduced for the Silver Age. Poor Doctor Mid-Nite was the sole Justice Society survivor left out of the Silver Age renaissance. 😢 JSA members who'd dropped off before 1951 were reintroduced piecemeal, as the concept of Earth-Two took hold and JLA/JSA team-ups gained popularity. The chart also shows how DC rolled out its reintroduction of second tier Golden Age characters. 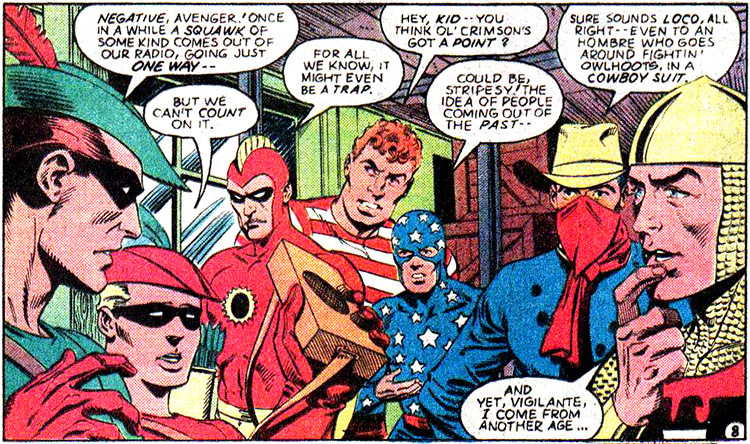 Aside from the JSA members, it was mainly the Seven Soldiers of Victory who came back in the 1970s. In the 1980s, All-Star Squadron emptied much of the remaining vaults. Because DC Comics has been in continuous publication, there are precious few Golden Age DC characters who haven't been reintroduced in some fashion. Add to that the Quality Comics and Fawcett Comics characters, and the legacies have been a goldmine for storytelling.